Becoming a biochemist might seem like an unexpected next step for a helicopter mechanic, but for Leonardo Acuna, the first recipient of the UGS Veterans Fellowship, it makes perfect sense. “I decided to be a mechanic for biological systems, and for me, that means becoming a biochemist,” he says. Born in Costa Rica, Leonardo moved to Miami before the age of 5. He began his undergraduate career at FSU but was unable to decide on a major. He could not justify paying FSU’s tuition while aimlessly taking classes, so he returned to Miami and finished his associate’s degree at Miami-Dade College. Shortly after, he joined the Marine Corps and hoped that time away from academia would give him time to narrow his interests. He spent the next 5 years fixing helicopters, rose through the ranks while gaining qualifications, and was deployed twice, leading his department for his second deployment. Leonardo enjoyed being a helicopter mechanic, and understanding how things operate has always fascinated him. “My time as a mechanic showed me I really enjoyed critically thinking to solve problems and using my hands,” Leonardo says. “So when my contract ran out, I enrolled at FIU as a biology undergraduate because biological science encompasses the same qualities I enjoyed about being a mechanic.” He graduated with a B.S. in Biological Sciences and a B.A. in Interdisciplinary Studies in December 2017 and decided to pursue a PhD in Biochemistry at FIU. 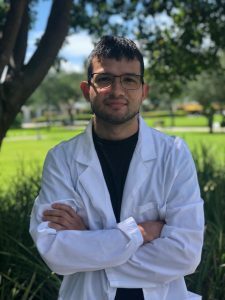 “I’ve had the honor to work with some amazing people at FIU, especially in Dr. (Manuel) Barbieri’s molecular cell biology lab, where I did undergraduate research and continue to work today,” Leonardo says. Leonardo also attended some open houses of several graduate programs at FIU and found the faculty to be very diverse, supportive and welcoming. He says he knew that he could learn a lot from them. Leonardo would eventually like to focus his research on the process of aging. “Although it may sound a bit foolish, I’d like to find a way to prevent it,” he says. One of the causes or contributors to aging are reactive oxygen species (ROS), which are also involved in cancer and many other diseases. Leonardo hopes that in his search for “immortality”, he can find ways to help others by furthering our understanding. “I would like to express my sincere gratitude to Dr. (Lidia) Kos and Dr. (Andrés) Gil for advocating for the creation of the Veterans Fellowship,” says Leonardo. He hopes to raise awareness of the new fellowship so that others may take advantage of the opportunity. Additionally, he would like to thank Dr. Barbieri and Dr. (Maria Luisa) Veisaga for supporting him in the lab and his graduate work.